So by now I think the word is out that the fall coffee flavors and pumpkin (or "punkin" if you pronounce it like I do) beers are hitting the store shelves. I also grabbed a few cans of pumpkin purée to start stalking up... Do you guys remember a few years ago there was a shortage and pumpkin purée was nowhere to be found?! Yeah if that happens again, lets just say this household will be alright. Haha! Anyway, in honor of all the fall excitement, I wanted to share this post with you all because it's also serving as my first giveaway! Since we're nearing the end of August I figured I need to get moving on the DIY projects that I'm planning for this Fall. In case you missed it, you can see my DIY Fall Wreath here. 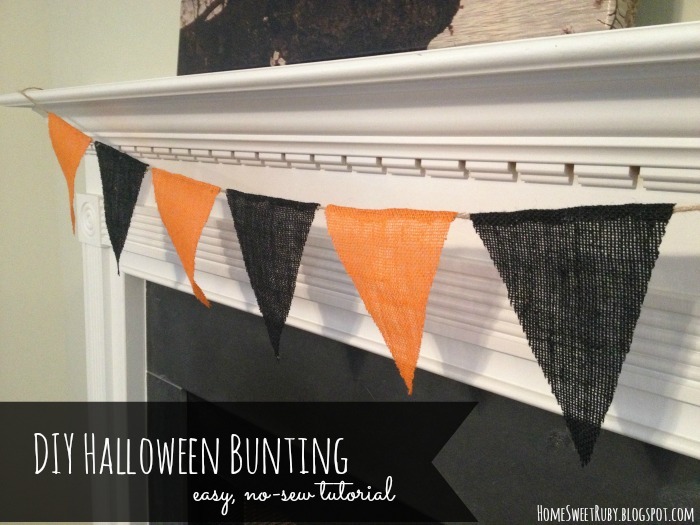 This is your very basic bunting project... anyone armed with burlap and a hot glue gun can do this project. There is absolutely no sewing required. I did both the Halloween version and the Thanksgiving version at the same time since the process is essentially the same, and its only one mess to clean up after cutting all of the burlap. Stay tuned for the Thanksgiving version in tomorrow's post! 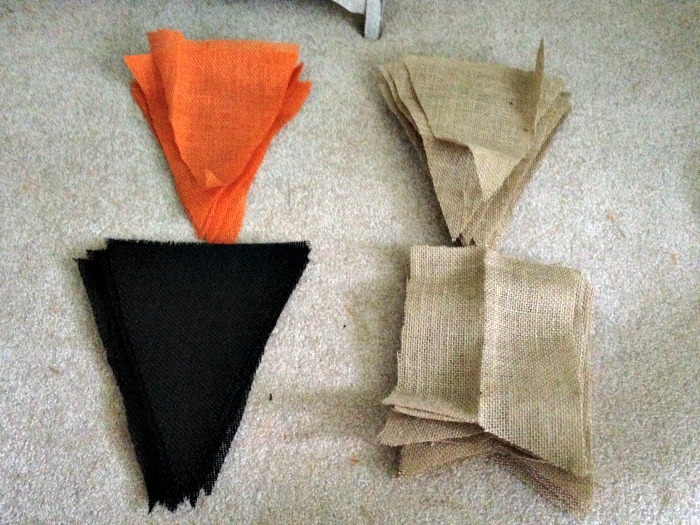 Note: If you're only planning the Halloween bunting, then you can forget the stencils, paint, and natural-colored burlap. Also, I purchased 1 yard of each color but a half yard is plenty for one burlap banner. You will still have leftovers of everything. First you need to make a burlap template in whatever shape your heart desires. I did this in Microsoft Word, selected Insert, and then Shapes. (Remember that you should make the template a little longer than you want the burlap to be, since we'll be folding the top around the twine and you will lose a little bit of that length.) I printed my templates on regular printer paper, but if you have cardstock, that is better. In order to make the cutting process faster, fold your burlap in half and line it up as best as you can. 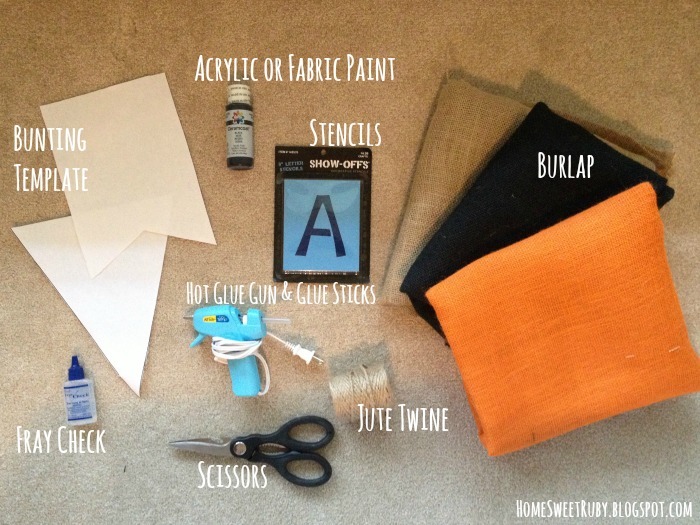 Place your template over the burlap and either trace it with a marker or cut as is. Use the sharpest scissors you can find, like fabric scissors or an extra pair of kitchen scissors if you're me, so that you can go through both layers of burlap easily. Spoiler: If you want to cut this whole step out, you can buy these pre-cut burlap triangles or pennants from the HobLob. After cutting all of your burlap into pieces, use Fray Check around the edges to keep the burlap from.... fraying! I've also read that Mod Podge can be used to prevent the fraying. 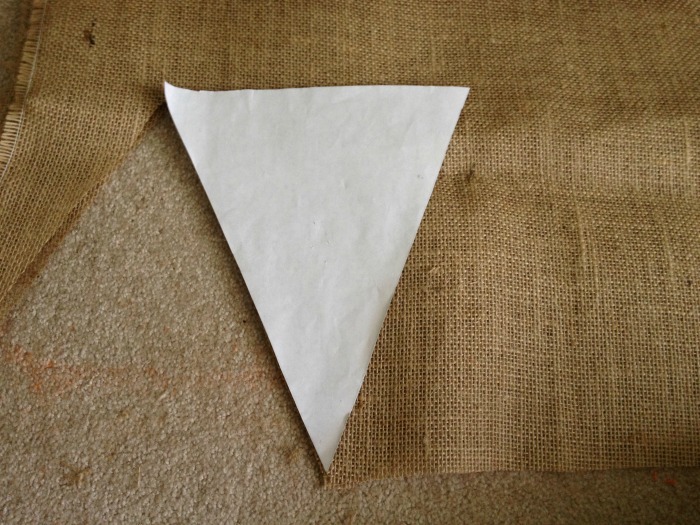 No matter how careful you are cutting burlap, it will probably fray and unravel a bit on you, so this step helps make sure you can use the bunting more than once. Here are all of my pieces, and I still have a half yard left over in each color of burlap since I bought a full yard of each. Next, iron the burlap pieces. You could do this before cutting the burlap but I think it was easier to do it with the smaller pieces. If you're doing a Thanksgiving version of this, decide what you want to spell on the burlap and paint over the stencil on each piece. Again, make sure to put the letter at least an inch from the top of the burlap. Now you should plug in your glue gun and measure how long you want the jute twine to be. Give yourself a little extra so you can tie it. Working with one piece of burlap at a time, lay the piece face down and apply hot glue about a 1/4 inch from the top. Press the twine into the glue and fold whatever burlap is left at the top over the twine and attach with glue. Continue with each piece of burlap, making sure that you're spelling your message correctly if you're doing a Thanksgiving version. Ta da! Our fireplace is a bit bare but that will change in September! 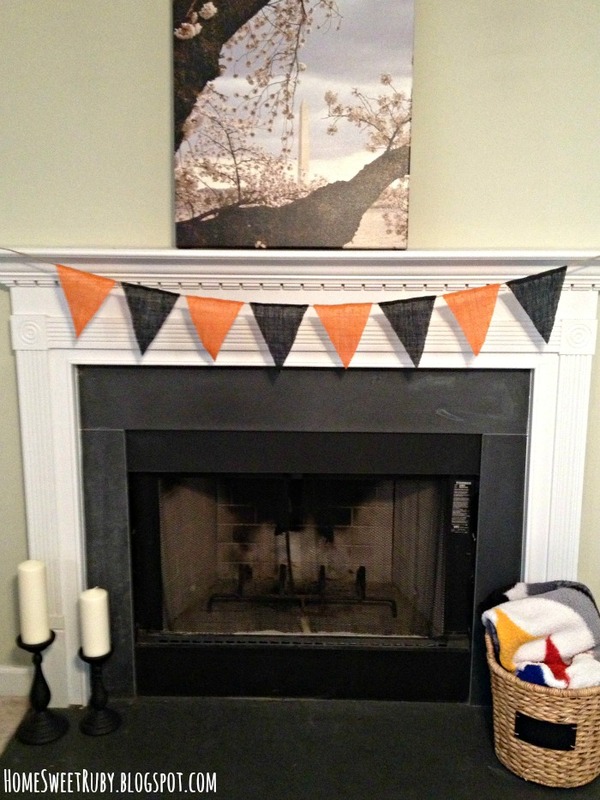 The winner will receive a Halloween burlap banner like the one above! 2. One additional entry for following on Instagram or Pinterest! Easy, right?! If I get over 50 entries, I will add another winner :) Giveaway begins today and ends on August 31st, then I will announce the winner(s) on September 2nd! This looks so easy but I love the look, of it! Thanks for the tutorial! I absolutely love these banners! So simple to make and will add some spirit to my decorating plans for this fall! Definitely! You can even stencil some words like Boo or Halloween on it if you want some more detail! Hey lady!! I actually found you through someone liking your Instagram post. 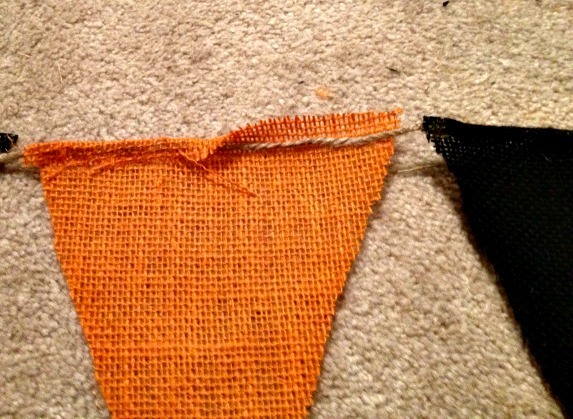 Love this bunting especially because it it the San Francisco Giants colors as well! Duel purpose!! New GFC follower! Hey Laura! Thanks for stopping by! 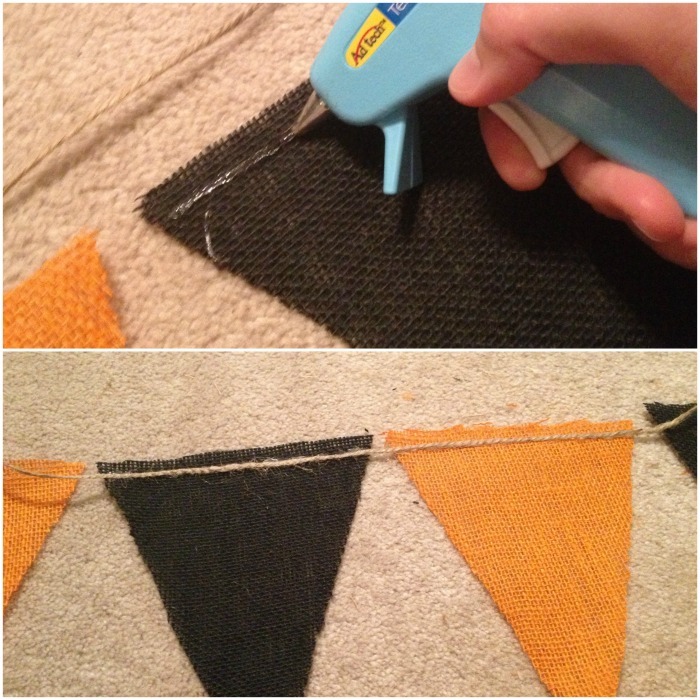 :) That is awesome that you can use the bunting for your Giants decor too, I didn't even think of that! Cute cute!! This makes me so excited for Halloween!! Thanks Brianne! I've been seeing a ton of Halloween decor at the stores and I'm excited too! I usually decorate with just general Fall decor but I'm trying to add some Halloween stuff this year!